Chi Town, I've got to hand it to you — you surprised me. A lot has happened since I ran the NYC Marathon last fall. 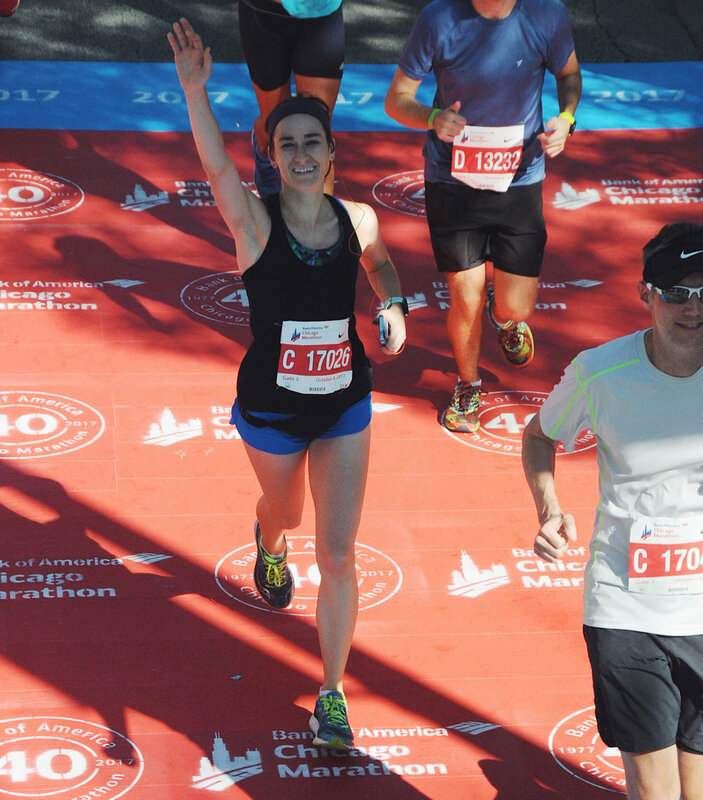 It was my first marathon + the first race that really made me want to work at being a stronger, faster, smarter runner. A month after NYC, I got excited + entered the lottery for the Chicago Marathon. I got in, I trained, and the rest is history. I can't believe I ran my second full last weekend! The race is one of six World Major marathons with 40,000 runners, so it's almost as huge as the NYC Marathon. I knew that going into this race, the atmosphere in New York would be tough to beat. But Chicago, you certainly know how to throw a party. As a tourist visiting the city for the first time in nearly 10 years, I felt so welcome. I was so excited to absorb the electricity of the crowd + run my best. I almost feel the need to explain why I'm writing this. Why should my blog on my portfolio site, as a professional, get a glimpse into why I run? Because I think running encompasses me at my most authentic, vulnerable, happy + ambitious self. Running energizes me every morning before I pixel-push all day at work — it even improves my mood + work ethic in other aspects of my life. Do I wake up every day and want to run 5 to 10 miles? Definitely not. But having the discipline + the desire to work at becoming stronger at this sport continues to teach me so much about myself, my priorities + my mindset. Having been training most of the year for races of every distance, 2017 has been pivotal in my growth as an endurance athlete. I love opening up about my experiences + what motivates me to reach new goals. It's just exciting, working to improve at something so personal, but that can also be shared with other runners on their own journeys. We all may seem crazy, I know — but I am moved by what draws people to this. I understand it. My expectations for Chicago were a bit all over the place. Earlier in the year, I had shocked myself by hitting PRs (personal records) in every distance I competed in: the half marathon (beat my PR 3 times), the 10K, the 5K and the 4 mile. The way that I trained had changed — I was logging more miles than before, but also just understanding the intent of each workout I did. To give you an idea, 2 days of the week would be hard effort in a workout, but everything else was easy + very slow, including the long run. All that was left for me to PR in this year was the marathon, so I knew when Chicago training approached, it was time to grind + work really hard from June to September. I ran a 4:04 in New York last year (9:19 avg per mile), so that was the previous PR. With my knee injury from then under wraps, my goal was to just cut that down as far as I could. Also, Chicago's course is also very flat, and New York's is very tough and hilly, so I figured that would help. I also decided that one of my goals (within the next few years) is to qualify + run the Boston Marathon. It's a big honor to do that as a runner. As a woman 18-35, I would have to run around a 3:30 to actually get into the race (8:00/mile... what?!). It's a prestigious race, it's hard, and it's heartbreaking because some runners try to qualify and run between a 3:30 and 3:35, only to be shut out by faster runners. Insane. Basically, If I ran a 3:30 marathon within the next year, I could qualify for Boston in 2019. In the back of my mind, that was kind of my goal — but I knew it was still a little out of reach for me to do in Chicago. I just didn't know how much. My friend Albert, a strong marathoner and BQ chaser himself, was also running Chicago and was kind enough to offer to pace me to a 3:30 during the race (men need a 3:05 to qualify for Boston, almost a 7:00/mile pace. I can't even fathom that). Knowing that I may struggle to keep up, I kind of laughed at the idea, but agreed anyway. With this in mind, my goal + strategy for the race was as follows: stick with Albert + run the 8:00/mile pace until I literally can't hold onto it any longer. And that's exactly what I did. On race morning, I did my usual routine: wake up extra early, drink a cup of coffee + eat my oatmeal with a banana + almond butter. I stayed in Lincoln Square and took an Uber downtown to Grant Park, where it all started. I used the bathroom about 10 times so I wouldn't have to stop during the race (every minute counts when going for time!) At 7:30 a.m., we were off — me, Albert, + his friend Marcus, who was also going for a 3:30. The #1 mistake that runners make during the marathon? They go out too quickly. It's easy to get caught up in the excitement, the crowds + the energy on race day. It's hard not to surge ahead, you feel amazing. You're on fire. Everything is wonderful. You trained for this, it's easy! You'll be fine in 20 miles. Except... you won't at all. That said, I knew my race strategy to start at a faster pace was not a smart one. But I really wanted to see how I would do at the pace. I wasn't worried about the first half of the race — we were aiming for a 1:47 half, a time I had run many times in the half marathon. Mile 1 was slow + congested. Around mile 3, I could hear everyone's Garmin watches buzzing as we flew through downtown Chicago. Our watches were so off + runners all around us were confused. "Is anyone else's watch acting up?" One girl asked. We all went through it. I decided not to fixate on that since it wasn't even accurate. I saw my parents at mile 4, who flew in from Pittsburgh to watch me run. It was amazing to see them and it gave me a boost! I was keeping up with the guys OK through the early miles, using the marathon playlist I created and getting pumped by the Yeah Yeah Yeahs and The Strokes tunes I added. I took my headphones out sometimes to focus on the crowd, but they helped when I needed to focus on the pace. I fueled at mile 6 with dates, deciding not to use gels for this race for a change. I wasn't hungry but knew I needed fuel. I continued to trail a few steps behind Albert and Marcus, who I knew where going a little faster than we had planned. I just focused on each step, knowing we were approaching the half. Grind grind grind. We hit 13 miles in 1:45. Only a 2 minute difference, but it was too fast. I was holding on OK by this point, but knew it was only a matter of time. The sun creeped out from behind the tall buildings and it started to get hot — it was 70 by this point. Marcus pushed ahead of us after the half and Albert stuck back with me. I ate a date, but I remember spitting out half of it, not wanting to eat at all. I was slipping during mile 15, feeling my pace fall from 8:15 to 8:30. "My wheels are starting to fall off," I remember telling him. "It's OK," he said. "Just focus on what you can do right now." I chugged on but those miles were getting slower. Up until mile 18, I thought maybe I could bounce back to the pace. But it kept dropping. 8:30 to 8:40, then 8:45, 8:50. By mile 20 I was doing 9+ minute miles, it was hot, and my legs were getting exhausted. For the first time, I stopped running to gulp down cups of water at the aid station. I ran again after a few minutes, but noticed that Albert had dropped off behind me. He had done a race the weekend before and his legs had completely given out. I was on my own now. Miles 20-26 during a marathon are some dark miles, man. All you have is your own mental strength. But this is exactly why I do the marathon. You grow more during those last 6 miles than you ever do during your 16 weeks of training. The heat was also getting real — at this point I was running a mile, then stopping at every water station to chug cups on cups of water. I didn't even care about time at this point, and I knew that mentally I had given up a little bit. I knew I could be pushing harder, but I just didn't feel like forcing it. I kind of accepted where I was — maybe because I knew that no matter what I was going to have a big PR. That 3:30 was not in reach; even the 3:35 pacers passed me + I just shrugged it off. This was my second marathon and it was not going to be the end of the world if I didn't qualify for Boston. I was still killin' it on the time, even with this ridiculous heat. At least that's what I told myself in the later miles. At 23, I saw my parents again. All the pain I felt in my body turned to love + happiness. I saw the finish line approaching, and the last .2 miles were uphill. The worst. At this point, I knew I was finishing, I knew I had one of my best times ever waiting for me, but for some reason, I wasn't emotional about it at all. I figured I would be crying by this point, like in NYC when I constantly teared up. Maybe my emotional connection wasn't as strong outside of New York. But I was about to finish this marathon + I was suddenly filled with happiness + pride, not really anything sad or too transformational this time. I knew it was the end + just cheered until I couldn't any longer. I was so content to get to that finish injury free + in one piece. I was a marathoner, x2! I remember crossing the finish + feeling pretty woozy, but you wouldn't know it from the finish photos. The heat just got to me — it was past 75 now. I drank 2 bottles of water in record time, then saw the free beer and went for it. I couldn't believe how good it tasted. I was kind of in a daze though, so of course I thought beer sounded good. I got a notification that said my unofficial finish time was 3:41:22, with an average of 8:21/mile. I was stoked! A whopping 23 minutes off my previous marathon time. The flat course certainly helped, but I could also tell that my body felt less wrecked than after NYC. I had also trained smarter this year. Woo! I met my parents + started to feel normal about 30 minutes later. No headache, no limping, no tears of pain or distress. All I have to compare this to is last time, when I felt nauseous the rest of the day with a pounding headache + a very sore knee. With none of those issues and a strong new PR, the race was a success! I feel so proud of this one, guys. I worked so hard for this, and every smaller race I ran all year was leading up to this one. I know that I put in the work + it was not easy. Hell no, not ever. I sometimes endured 4 am wakeup calls for long runs before work. I once ruined my running shoes from bleeding on them (thank you, blood blisters). I gave myself hundreds of pep talks during runs where I was not mentally into it. I ran on the track until I felt like throwing up. I once ran for hours through an awful thunderstorm. But most of all, I believed in myself every damn day. I was the only person who saw all the work I put in, especially everything that couldn't be measured like my miles and pace. Persistence. Resilience. Compassion. Discipline. Effort. Heart. I never decided to run for anyone but myself — I am the only person I am out there to impress. I want to believe in myself when no one else will. And I do. I want to grow as a runner because it motivates me to grow at everything else in my life. Nothing ignites a fire within me like working toward a big goal. I still think the BQ is possible for me down the line. I'll keep working. But for now, I'm celebrating how amazing Chicago went. I loved those wide city streets and I'd do it again! Also still dreaming about deep dish pizza... yes, please! Older PostMy first album artwork!